There’s a great deal of news these days about potential developments to increase healthy longevity. How can we decide which are the most promising initiatives? What can we do to support faster development and deployment of new treatments? If we want to enable significant increases in healthy longevity for ourselves and our loved ones, what steps should we be taking? This whole subject – healthy longevity – is complicated by the fact that it’s clouded by a great deal of wishful thinking and misinformation (some deliberate, some unintentional). Companies have products and services they wish to promote. Whole industries have worldviews that they want to maintain. People have engrained personal habits that they wish to justify and rationalise. Who, if they were honest, would not like to grasp the possibility of the kind of healthy age-reversal depicted here, if it could be provided ethically, for them and their loved ones? But what steps should we take, that would be most likely to accelerate the enablement of such a transformation? That ninety minute discussion covered a lot of important topics, but it’s far from providing the last word on the matter. To help continue the discussion, I’m holding an “in real life” London Futurists meetup on the afternoon of Saturday 26th April in Birkbeck College, central London. There will be a number of TED-style talks, followed by extended audience Q&A and discussion. See here for more details about this event – and to RSVP if you’re planning to attend (this helps me to organise it smoothly) . The speakers are Phil Micans, Tuvi Orbach, and Avi Roy. They each have fascinating and well-informed things to say about the subject. I expect those of us in the audience will all be individually challenged and inspired, at various times in this meetup, to rethink our own personal health strategies, and/or to alter our thinking about how to change society’s presently inadequate approach to this topic. Phil Micans is Founder and Vice President of International Antiaging Systems and Assistant Director at the British Longevity Society. Phil has been actively involved in the antiaging field since the late 1980’s. He is currently the Editor-in-Chief of the Aging Matters™ Magazine, Chairman of the Monte Carlo Antiaging Congress, and Assistant Editor to the Lifespan Medicine Journal. He holds a masters degree in biochemistry from Canterbury. Phil will talk about why orthodox medicine must change its approach to longevity, and the need for preventative and regenerative medicine. His lecture will review data as issued by the US, UK and WHO authorities. It will become clear that ‘orthodox’ medicine cannot continue as-is for much longer and that a different path will need to be taken soon. The talk will also introduce the concept of the optimal health pyramid. Tuvi Orbach is the chairman of Mindlife UK, and Managing Trustee of HELP Trust – a charity with the purpose to help and inspire people to enhance their lives. Computerised health screening and prevention for long-term conditions. Tuvi will address combining the use of technology for self-help with better internal (mind-body, optimism etc) and external lifestyle modification. He’ll also talk about the integration of new science with traditional wisdom. Avi Roy is is a PhD student researching biomarkers of aging, mitochondria, and regenerative medicine at the Institute of Translational Medicine, Buckingham. Avi currently writes for The Conversation and has previously written for The Guardian. His articles have also been published in the New Statesman and Business Insider. Avi also heads up the Oxford University Scientific Society, the Oxford Transhumanism and Emerging Technologies society, and organizes talks at the British Science Association Oxford branch. 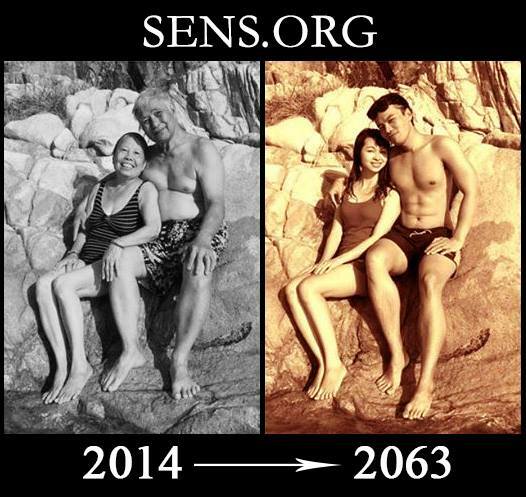 The above 2014->2063 transformation picture has been adapted from (you guessed it) a similar one which portrayed the transformation in the opposite direction, 1963->2014. That earlier version was published in the Twitter stream for “History in Pictures”. So there’s at least one round of “cosmetic retouching” that has taken place. The online comments for the earlier picture suggest that it has been “faked” too. Vision: Within 30 years, those of us still alive will have the potential to experience profound human enhancement. Detox and rejuvenation therapies that clean out internal biological damage will be able to revitalise us in far-reaching ways. Smartphone technology will be miniaturised and ready for incorporation deep inside our bodies and brains. We’ll be living alongside enchanting, witty robots and other forms of super AIs and virtual companions, who will have deprived most of us of gainful employment. We might even be on the point of merger: human with robot, biology with technology. But which elements of this vision are science fiction, and which science fact? What factors influence the acceleration of technology? And how can we collectively mould the trajectories ahead, so that human values flourish, rather than us bitterly regretting what we allowed to happen?